A week and a half ago, I was in Barcelona and stumbled a protest that seemed well-organized and was immediately engaging. With my limited Spanish, I managed to pick up slogans like, “Beauty is not for sale,” and “Barcelona is dead.” It became immediately obvious that the protest was politically and artfully-motivated. From an outside perspective, those statements seem extreme, especially considering Barcelona is known for its street art. Street art radiates practically from every corner of the city, and I’m not just talking meaningless little tags here and there. Barcelona is a storehouse of graffiti and street art pieces that actually look as though they took time, passion, commitment, and energy. What then, caused this outpouring of anger from the art community of Barcelona? Not many people in Spain speak English that well, so after an hour of standing around wondering, I finally decided to try my luck and ask around. In Spanish, I was told something along the lines of this. The protest stemmed from police actions that resulted in the closing of art spaces in a nearby neighborhood. The closed spaces were important hubs for musicians and artists alike, and as a result, the artistic community felt patronized and felt that bureaucratic decisions involving their livelihoods were being made without their input. People of all ages participated in the peaceful protest, which was artistic in and of itself. A giant banner was unfurled on which visitors were allowed to scrawl their opinions. A booth tacked with, “Take off your pants!” encouraged visitors to defy the norm and take Polaroids of themselves naked. It is only in a city like Barcelona with such a lively street art scene that such a demonstration can happen. While I cannot fully grasp the ramifications of all this bureaucracy on the Barcelona art community, I sincerely hope that it emerges from this better than before. If you can read Spanish, head on over to culturadebase.net to find out more information about this movement. If you know more information about Cultura De Base, please share your knowledge. Thanks! Contemporary art really gets a bad rap sometimes. A canvas painted solid blue or an collage of abstract shapes might catch the eye of some, but it simply can’t be understood by everyone. Maquinas & Almas, Arte Digital Y Nuevos Medios (Machines & Souls, Digital Art and New Mediums) is a new temporary art exhibition at Madrid’s Museum of Contemporary Art, the Reina Sofia. This exhibition probably features contemporary art that is as universally-accepted as contemporary art will ever get. Right now, simple electronic objects garner the attention of practically all human beings on the planet. Maquinas & Almas combines technology and art in an amazing, creative, and participatory way that engages even the largest of contemporary art skeptics. Unfortunately, half of the exhibition closed on September 15th. Luckily, the remaining part of the exhibition was strong enough to stand alone on its own. 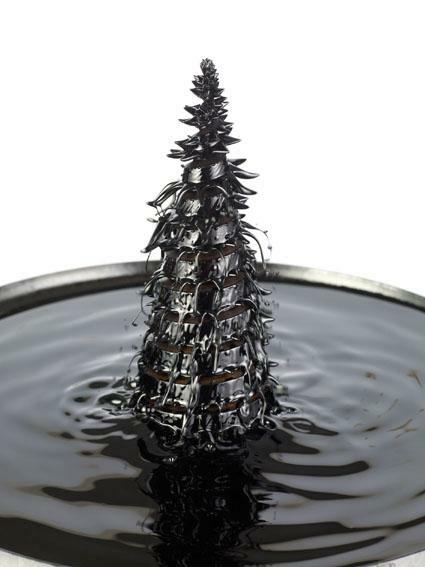 For starters are some relatively well-known pieces by Sachiko Kodama, which utilize toxic magnetic fluids and electrical pulses to create moving black structures. One installation that held my attention for about an hour was Ben Rubin and Mark Hansen‘s Listening Post installation. The two hung small LCDs in a 11 tall and 21 wide rectangular shape, and filled the LCDs with various text tidbits datamined (remember in The Dark Knight?) from thousands of online chatroom conversations. Sequenced and timed alongside sound effects and digitalized voices, the installation was broken up into various arrangements of audio and visual harmony. Once the arrangements had cycled through their program, the viewer would then find that even though the upcoming texts repeated the same patterns, they didn’t necessarily have the same datamined words. Only a person who stayed at the installation for hours would legitimately know how many iterations it really has. But words cannot adequately describe an installation such as this one, so why don’t we try using a video? While there are other pieces in the exhibit that were notable, Daniel Rozin‘s Trash Mirror stood out the most. The piece is assembled like a mosaic, with individual pieces of recycled trash placed side by side to create a nice neat rectangle. An overhead light illuminates all of the pieces, and when no objects are nearby, all of the trash is clearly visible. When someone stands in front of the trash mirror, however, motion sensors then reflect the “mirrored” pieces downwards, removing them from the direct overhead light. The result is a pulsing, twitching shadow that mirrors the form and actions of the individual standing before it. Again, enough talking about the piece, though… go to http://www.smoothware.com/danny/newtrashmirror.html to see the Trash Mirror in all its moving glory!! It seems like just yesterday that the Seattle urban art non-profit Artifakt was started. Run by dozens of volunteers, Artifakt brings in fresh artists and live music to nearly all of their events and have really made quite a name for themselves in the last two years. Tomorrow is their celebration at Lo Fi for their two year anniversary. Be there or be square! 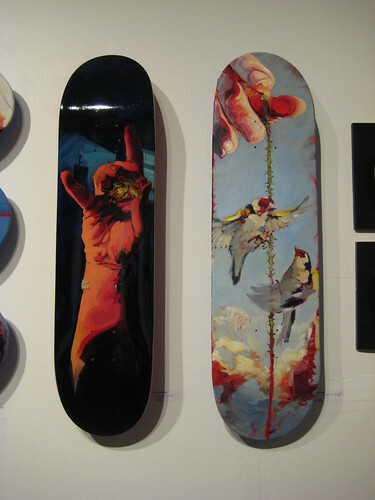 Amongst the headlining artists on display is Chris Sheridan, who has some new skateboards on display in the photos below. Which is your favorite? Evidently Dave Barnes is a somewhat famous soul musician, but that’s not the Dave Barnes we’re talking about here. The Dave Barnes we’re talking about is a Canadian artist and illustrator who combines gritty materials and dated colors with polished illustrations to form what he calls “oldification.” His pieces are nostalgic yet humorous and modern at the same time — the best of all times. And, as you’ll notice in this piece below, Eatin’ Right, Barnes pays a lot of attention to small details. 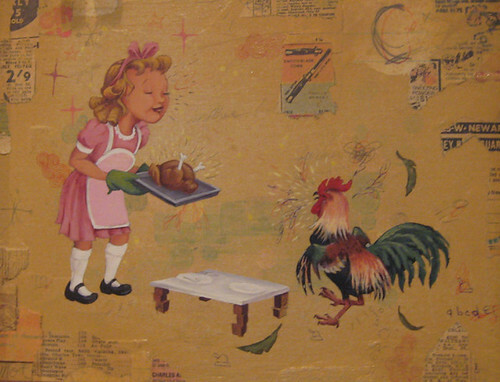 Check out the random related newspaper clippings, the pen marks added around the rooster’s head, or the slightly faded starbursts in the background. Barnes will be a part of a group show titled “Made In Canada,” at the Bear and Bird in Fort Lauderdale, Florida. The show opened yesterday, and Barnes’ work will be shown alongside that of artists like Rey Ortega and Lori Joy Smith. Since it carved out a hole for itself out of what was formerly the Snowboard Connection, the Canvas Gallery has really set itself apart from other galleries in the Pioneer Square area. Its prime location right below the 619 Building and its selection of diverse artists spanning numerous mediums makes any trip to Canvas an interesting one. 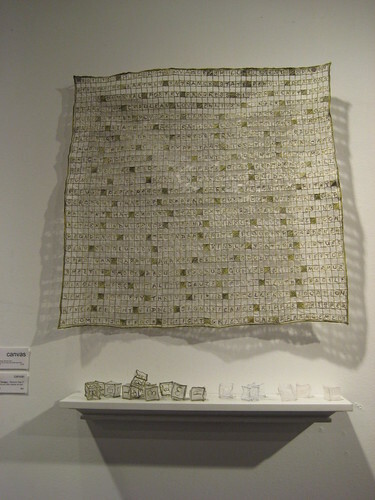 Of particular interest was this month’s show, which had one side of the room largely dedicated to textile art. This side of the gallery housed a complete visual feast. Take for instance Maura Donegan‘s Memento Vitae I and Memento Vitae IV, shown below. As their names might suggest, these pieces are a reflection upon her life, playing carefully on her childhood (and current) love for words. 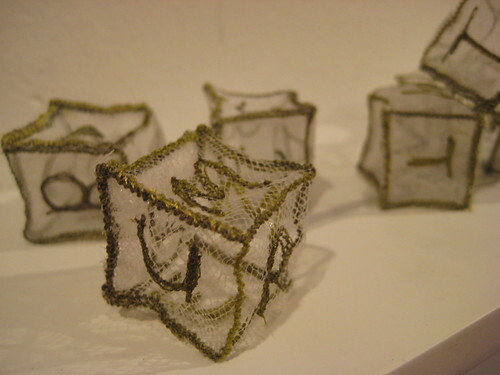 In both pieces, words with special meaning in Donegan’s life were selected to create pieces that are as much experimental textile art as they are an extension of Donegan’s literary mind. The six-sided dice in Memento Vitae IV are in fact six-letter words that viewers must piece together for themselves. Memento Vitae I is a crossword puzzle with carefully stitched boxes filled with yet more words that are vital to Donegan’s memory. Further down the wall was a piece by Lauren Davis, entitled Me/ You. 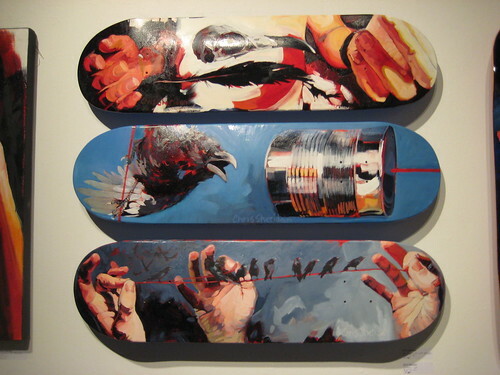 The piece shows two photographs of hands, each from a different individual. 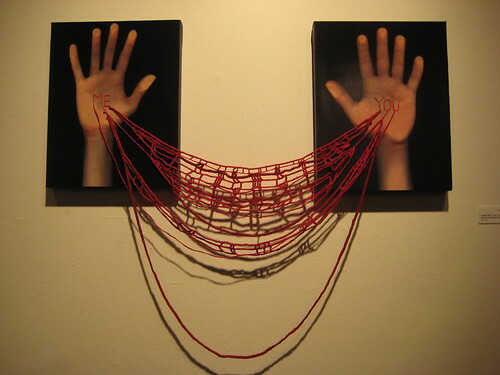 The hands are then permanently linked together with bright red string. A simply idea, sure, but well executed. 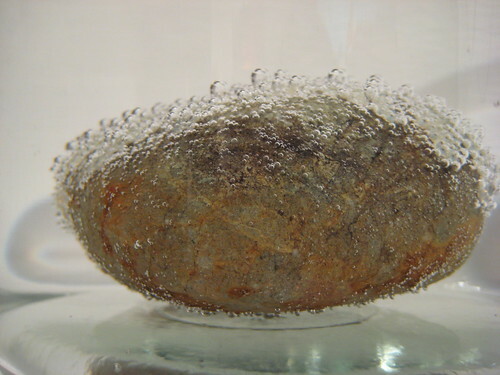 Remarkably, though, the most entertaining things for me in the whole gallery were canisters of miniature beads glued onto porous rocks and then submerged in water. Jenny Joyce brought forth four ridiculously creative, experimental pieces that simply utilized water, air, and vibrations in the room to bring forth displays that have the hypnotic entertainment level akin to watching jellyfish swim around a tank. 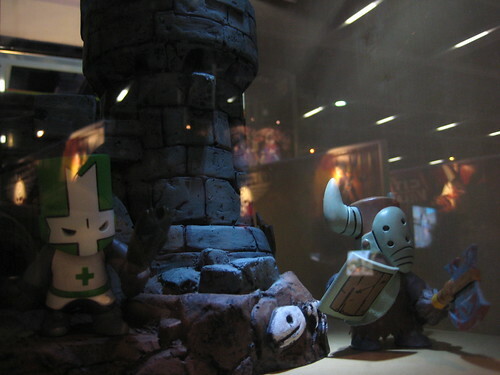 Castle Crashers Vinyl Toys? Yes, Please. Castle Crashers is one of XBox Live’s newest runaway hits. It brings back the side-scrolling video game action that those of us who grew up on Nintendo and Super Nintendo know so well. It’s about time someone made a game that scrolled sideways and was attractive to the new generation. With kickass animated graphics, cuddly cuddly characters, a remarkably disgusting yet hilarious sense of humor, and one of the most epic soundtracks ever to grace the XBox Live Arcade, Castle Crashers is building up momentum through word of mouth, and it doesn’t seem to be slowing down. This weekend, an ultimate nerd-fest, PAX (Penny Arcade Expo) came to Seattle and artists from Castle Crashers holed up in a booth. They brought with them glorious glorious vinyl toys of the game’s knights and one of its barbarian. Two life-sized foam characters were also present. At “Buy 3, Get 1 Free,” the vinyls of the knights probably sold much, much better than anyone with Castle Crashers could have ever anticipated. They sold out far before the event was over. But for those of you who are still interested, the vinyl’s will be available on their website, and it is a great bridge between the videogame world and the urban street art world.